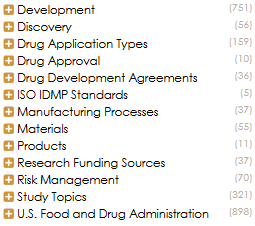 We have enlarged the Drug Development Taxonomy to include the manufacturing side as well. The development of a new drug is a process that takes a considerable amount of time. It includes identifying a lead compound, completing the clinical trials process, and obtaining regulatory approval. The average time it takes to develop a drug is 12 years. Then the manufacturing process begins. The expanded WAND Drug Development and Manufacturing Taxonomy includes terms related to the manufacturing process as well as the development side. It is designed to provide anyone involved in the development and manufacturing of new medicines the ability to tag and organize the enormous number of documents generated during these processes. This taxonomy provides a strong foundation of 2,475 terms and 2,128 synonyms and it can be customized to include terms specific to the drugs that are currently being, or have been, developed. The WAND Drug Development and Manufacturing Taxonomy covers the process of bringing a new drug to market. Higher level terms include Discovery, Development, Drug Application Types, Drug Approval, Drug Development Agreements, Research Funding Sources, and the U.S. Food and Drug Administration. On the manufacturing side, higher level terms include Materials, Products, Manufacturing Processes, and Risk Management. Use the WAND Drug Development and Manufacturing Taxonomy to better organize data and content as you navigate the path of inventing, developing, and manufacturing a safe and effective new drug. The companion taxonomies are the WAND Manufacturing Taxonomy - an overarching taxonomy - and the WAND Packaging Taxonomy. The WAND Drug Development and Manufacturing Taxonomy, as with all WAND Taxonomies, is available by itself or as part of the WAND Taxonomy Library Portal.